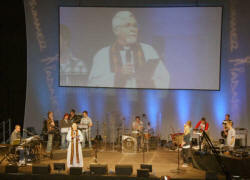 Over 4,500 young people packed the King�s Hall for morning worship and Holy Communion on Sunday 29th June. They were just some of over 6,000 day visitors and campers that attended Summer Madness, the largest Christian youth festival in Ireland. 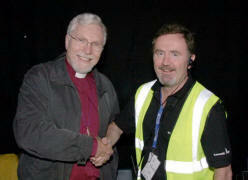 The Right Rev Harold Miller, Bishop of Down & Dromore led the service and conducted the act of communion. The speaker was Peter Greig (24/7 Prayer Movement) and Ian Hannah (Musical Director) and his team of talented musicians and vocalists led the lively praise. During the service, the Bishop was congratulated on his new appointment as President of Summer Madness, an event he has attended every year for the past 20 years and one that he is proud to be associated with. 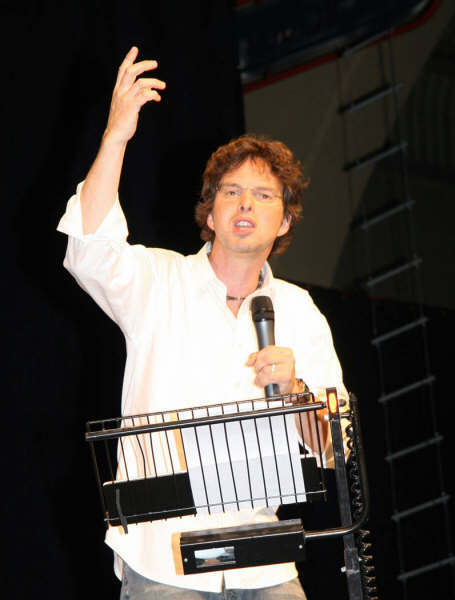 In an inspirational address, Peter Greig spoke of the need to have Jesus in your heart and encouraged them to start a revival by getting involved in Christian groups at school and at college campus reminding them that if they gather in Jesus name - He will be there with them. He concluded by challenging the large crowd of young people to be an outward signpost for Jesus pointing others to Him who gave His Son to die on the cross and to whom we own everything. Summer Madness Project Director John Kee congratulates Bishop Harold Miller on his appointment as President of Summer Madness. 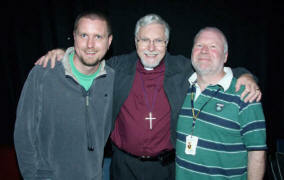 The Right Rev Harold Miller (Bishop of Down & Dromore) pictured with Ian Hannah (Musical Director) and Adrian McCartney (founder member of Summer Madness). The Right Rev Harold Miller (Bishop of Down & Dromore) pictured with Des and Judith Cairns and their daughter Beth who are members of Lisburn Cathedral. The Right Rev Harold Miller (Bishop of Down & Dromore) addresses over 4,500 young people who packed the King�s Hall for morning worship at Summer Madness. Ian Hannah (Musical Director) and his team of talented musicians and vocalists pictured leading the lively praise backed by over 4,500 young people who packed the King�s Hall for morning worship at Summer Madness. 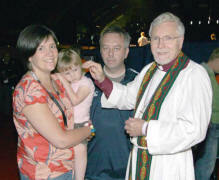 The Right Rev Harold Miller (Bishop of Down & Dromore) conducting Holy Communion for over 4500 young people who packed the King�s Hall for morning worship at Summer Madness. 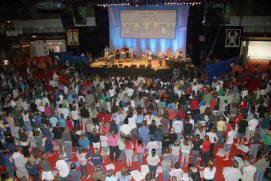 Some of the 4,500 young people who packed the King�s Hall for morning worship at Summer Madness. 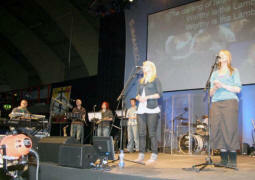 Ian Hannah (Musical Director) and his team of talented musicians and vocalists pictured leading the lively praise backed by over 4,500 young people who packed the King�s Hall for morning worship at Summer Madness last Sunday morning. 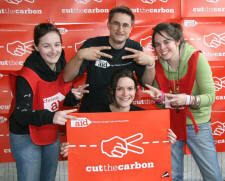 At the Christian Aid �Cut the Carbon� display at Summer Madness are L to R: Laura Kelly (Railway Street Presbyterian Church, Lisburn), Dave Thomas (Youth & Schools Officer - Christian Aid Ireland), Lucy Young (Saintfield Parish Church) and seated - Ruth Miskelly (Lisburn Elim Church). 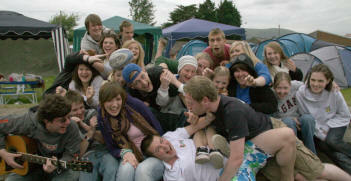 A group of young people from First Lisburn Presbyterian Church pictured really enjoying the MADness at Summer Madness.